Modifications: I added an onion because I don’t know why you wouldn’t have one here. I also put some of the mushrooms in while cooking the risotto. I added the onion to the pot first, then the garlic, then mushrooms. Once those were cooked, added the rice and then the white wine (I always use vermouth for risotto), and then proceeded with the broth/stirring steps until it was done. Then I did the butter, garlic, and the rest of the mushrooms with the spinach and topped with that. Kids: They hate rice. I don’t get it either. 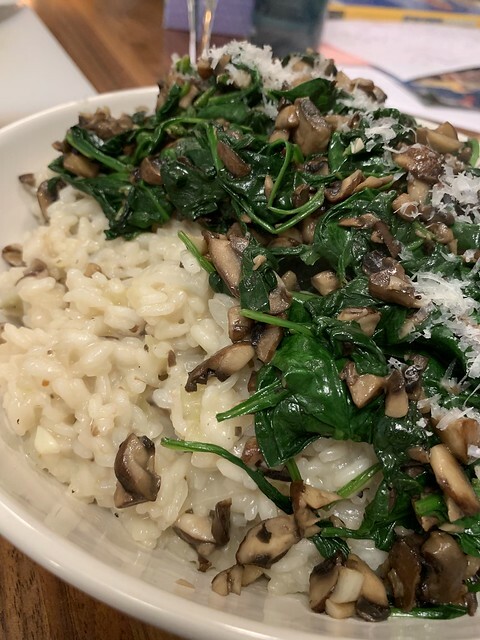 They all tried one bite and proclaimed it disgusting, even though I gave them just the plain risotto without the mushrooms and spinach. WHATEVER CHILDREN. This entry was posted in cheese, garlic, greens, mushrooms, onion, parmesan, rice, vegetarian. Bookmark the permalink.